Welcome to the ISR homepage. I'm proud to present an online version of our catalogue. Here you'll find product and ordering information plus a section with details about some of the projects we've been involved in. E-mail your order to order@isrbrakes.se. For general questions, please contact us by using the good old phone or fax. Enjoy! 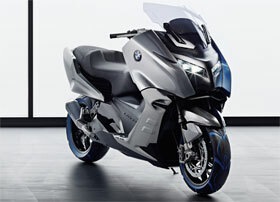 ISR are very proud to supply the new BMW Concept C with calipers, discs and master cylinders. A close cooperation with the design department at BMW in Munich resulted in a clean looking brake system. Check out the Concept C here . Mean, lean and clean. This Ducati Monster is stripped down to the bare necessities of life. A modern version of a true Café Racer – this little bike flicks through double apex corners as if on rails. Forza Brutale! 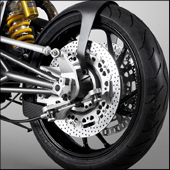 Hub-centre steering for your bike! Click to read more.